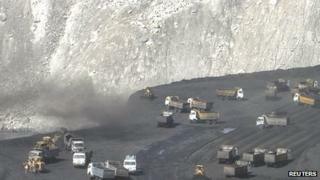 There was outrage in India's parliament after a draft report by government auditors estimated India lost $210bn by selling coalfields too cheaply. Opposition politicians accused the government of "looting the country" by selling coalfields to companies without competitive bidding. Private and state companies benefited from the allocations between 2004 and 2010, says a Times of India report . But the auditor says the leaked draft is "exceedingly misleading". In a letter to the prime minister's office , the Comptroller and Auditor General (CAG) said "the details being brought out were observations which are under discussion at a very preliminary stage". The letter says the draft report is still under preparation: "In fact it is not even our case that the unintended benefit to the allocatee is an equivalent loss to the exchequer." But the Times of India, quoting the CAG draft, says the $210bn (£133bn) figure is a "conservative estimate, since it takes into account prices for the lowest grade of coal and not the median grade". India is one of the largest producers of coal in the world. This is just the latest in a series of financial scandals to hit the Congress-led government and the revelations caused such anger among opposition politicians that both houses of parliament had to be temporarily adjourned. Prakash Javdekar of the main opposition Bharatiya Janata Party said they would not allow the Congress-led United Progressive Alliance to continue "looting the country". "We will discuss with our leaders and decide the next course of action," he added. D Raja of the Communist Party of India (CPI) blamed government policy for "favouring all corporate houses and big business houses in the country". "Already we have been discussing the question of illegal mining... here it is related to the policy of the government. Minerals are national assets and property of the nation," said Mr Raja. India has been hit by a number of mining scandals in recent months. Last August the chief minister of Karnataka state, BS Yeddyurappa, quit after he was implicated in an illegal mining scandal that an ombudsman said cost the state $400m (£250m) - he denies the charges. And in November a report claimed that nearly half the iron ore exported from the western state of Goa is illegally mined. The Comptroller and Auditor General is expected to submit the report to parliament in the current session, according to the Times of India. It was a CAG report that exposed the country's biggest corruption case to date, the so-called 2G scandal, in which mobile phone licenses were sold at a fraction of their value at an estimated cost to the exchequer of nearly $40bn (£24.5bn) in lost revenue. Former telecoms minister A Raja along with several others are currently on trial over those allegations. All deny wrongdoing.